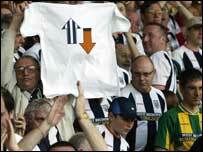 West Brom celebrated automatic promotion with a comfortable victory. The Baggies clinched a return to the Premiership after Sunderland's lunchtime draw at Wigan and relegated Bradford could not spoil the party. Jason Koumas created the opener after 55 minutes when his shot came off the bar and Geoff Horsfield was on hand to nod home from only six yards. Lee Hughes added the second five minutes later when he fired home a powerful right-foot angled finish. The win also kept the pressure on leaders Norwich in the chase for the First Division title. Thomas Gaardsoe's 14th-minute header almost handed Albion the lead, only for Bantams keeper Mark Paston to turn his effort around the post. Baggies keeper Russell Hoult then did likewise to prevent Lewis Emanuel's right-footed effort from the edge of the box opening the scoring for the visitors. Predictably, the Baggies began to gain the upper hand with Hughes and Horsfield heading the home side's attack. For the time being, however, the experienced duo of David Wetherall and Peter Atherton at the heart of Bradford's defence thwarted the home side's first-half attacking efforts. But their resilience was undone by the swift double strike and Hughes was unlucky not to register his second goal when his fine effort from the edge of the box hit the woodwork. West Brom: Hoult, Robinson, Gaardsoe, Gregan, Clement, Chambers, Johnson, Kinsella, Koumas, Hughes, Horsfield. Subs: Murphy, Dobie, Volmer, Dyer, Facey. Bradford: Paston, Gavin, Wetherall, Atherton, Heckingbottom, Summerbee, Penford, Wolleaston, Cadamarteri, Windass, Emanuel. Subs: Combe, Bower, Kearney, Forrest, Sanasy.